There’s a reason why Cafe EZ is always busy. Their fresh and homemade brunch dishes, crepes, kimchi fries and other specialties keep bringing people in. Come early though, as tables fill up quickly at this Howard County hot spot. The owner, Katie, grew up helping her parents run their businesses and knew she wanted open one of her own. Her goal is to provide comfort food made with only the freshest ingredients and everything is homemade. She says many of her recipes are the result of experimentation and practice. A true fusion restaurant, there is something for all tastes on the menu. That includes those in need of gluten free and vegan options. 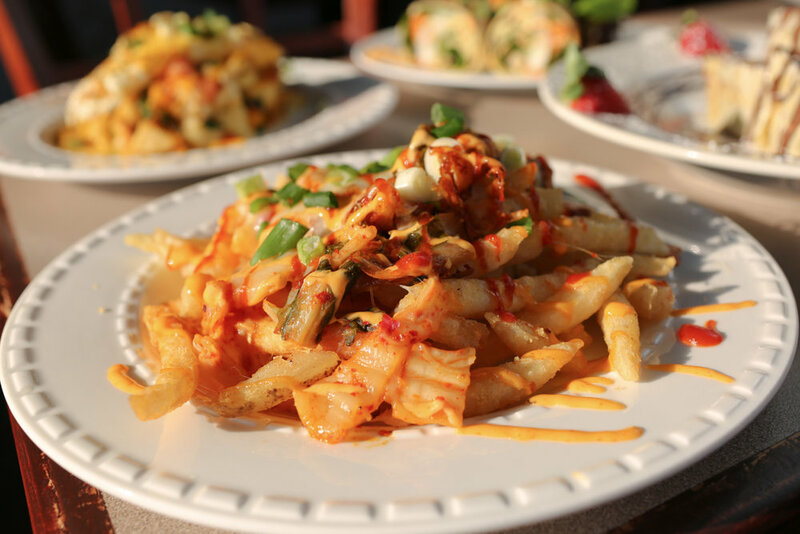 Fries layered of Caramelized Kimchi & Bulgogi. Sprinkled with shredded cheese and squeeze on chili mayonnaise. Topped with chili sauce, sesame seeds, ionions and cilantro for taste.